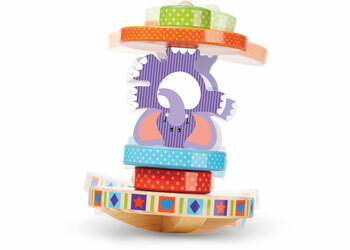 Sort, stack, and rock six brightly coloured wooden pieces, including a topsy-turvy elephant! 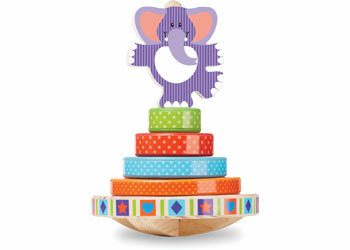 A sturdy wooden stacking rod sits on a curved base that rocks and spins. 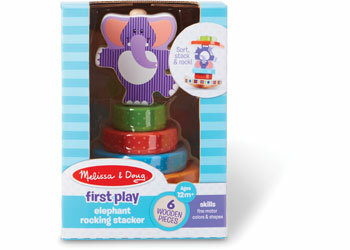 The smooth pieces are easy for babies and toddlers to grasp. They will delight in sorting and balancing pieces with developing fine motor skills and hand-eye coordination through imaginative play. 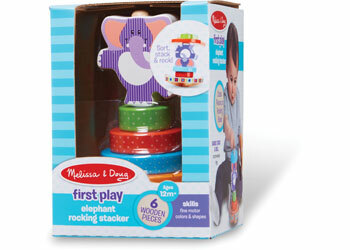 First Play toys feature bright colours, bold patterns and whimsical designs that boost skills while sparking imagination and wonderright from the start!